We’ve warned for years about what we call “ice-nine.” This refers to government’s ability to lock down the financial system in the next global crisis. In the 2008 crisis, governments met the demand for liquidity by printing money, guaranteeing banks and money market funds and engaging in trillions of dollars of currency swaps. The problem is that the central banks still have not normalized their balance sheets and interest rates since the last crisis and are unlikely to be able to do so before the next one. Money printing won’t be an option because central banks have printed too much already. Any more money printing would trigger a complete loss of confidence in fiat money and a mad scramble for hard assets. Instead of money printing, central banks and governments plan to lock down the system and not let investors get their money out. This will begin with money market funds, then spread quickly to bank accounts, ATMs and stock exchanges until the entire system is frozen. Then an international monetary conference will be convened to create a new global monetary standard, probably based on SDRs, which will be printed by the trillions and handed out to governments to gradually reliquify the system. Governments can see this coming and are already taking steps to prepare for more extreme measures. A few years ago, the SEC changed the rules so that U.S. money market funds can suspend redemptions. Two weeks ago, China announced that it would follow suit and allow its money market funds to also suspend redemptions. 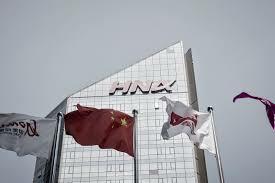 Now, as this article shows, China has halted trading in the stock of one of its largest companies, HNA. This comes on top of the government takeover of another giant Chinese corporation, Anbang Insurance, at the end of February. Governments are preparing for ice-nine and the lock-down of banks and stock exchanges. You should prepare also by buying physical gold and silver to be kept outside the banking system.